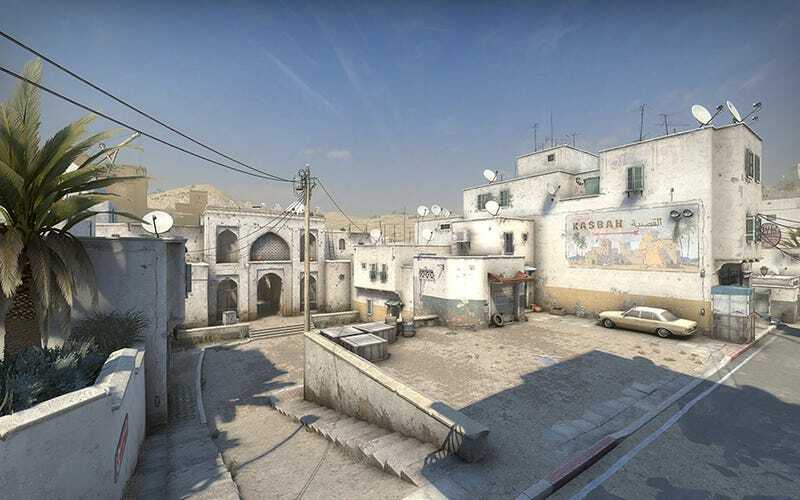 Valve has once again tampered with the holy grail of Counter-Strike maps, Dust2. Long considered a gold standard not just for CSGO, but for multiplayer maps in general, it’s very difficult to tangibly improve without accidentally knocking the overall synergy of the map out of balance. Has Valve succeeded this time? I asked a handful of prominent community mapmakers for their thoughts. Valve’s new version of Dust2 gives the classic map a big graphical upgrade, adding higher-res textures and new art across the board. It also changes up some popular cover spots and spaces, seemingly in an effort to make the map move even faster than it already did. Everybody I spoke to agreed that this isn’t an overhaul of Dust2 so much as it is a visual makeover with a few mechanical touch-ups here and there. He added that readability (that is, one’s ability to immediately understand an area, where other players are, etc) and use of space have been subtly improved. The former, especially, is a place where the visual overhaul directly affects gameplay. Shawn “FMPONE” Snelling, whose fingerprints are all over beloved maps like Cache and Santorini, explained that Valve has given the map a very cohesive and “tactile” look, making it easier to get a read on your surroundings. Snelling did, however, offer a handful of specific critiques on Twitter, pointing out places where the new Dust2 sacrifices readability in favor of visual panache. Mapmaker and YouTuber 3kliksphilip also pointed out that, among other things, Valve has added a few vertical obstacles, like new trees and wooden poles, to the map. The former, he believes, exist to subliminally aid players in lining up tricky grenade throws. The latter, meanwhile, allow you to bounce grenades off them, opening up new avenues of strategy. He also noted that roofs and walls around areas of conflict are almost unanimously lower, allowing players to more easily throw grenades and press the action if, say, they want to stop a long A rush. Lastly, it’s a small thing, but 3kliksphilip enjoyed that the map now has little offshoot areas that you can’t actually enter, but that make Dust2 feel less like a godless murder purgatory and more like a real place. The new Dust2 is still in beta, which means it’ll probably receive some slight tweaks and bug fixes before it goes live. Still, by and large, it seems like CSGO mapmakers already view it as a success. Valve didn’t reinvent the wheel, but they added another layer of much-appreciated polish (or, I suppose, dust) to it.